Integration trials have successfully been performed with the SNAKE and DEKRA visual inspection system on a real pressure vessel. The trials were performed on the OC Robotics premises on a cut-open real pressure vessel. The test phase started to check the integration of the main components. DEKRA checked the functionality of provided parts (NDT tools, primary camera, etc.) together with the robots. The possibility to handle the equipment or the lighting angles are examples of what have been successfully tested. Integration tests were also performed with the FAST platform built by ALSTOM. This also resulted in some points that need to be taken care of to get the combined system to work properly. “So, we are in a state where tests are focused on functionality. The next testing step will be to focus on inspectability” said Joakim Strand, project leader of Working Package 1. For all tests, both handleability and inspectability, it is a great advantage to have a real pressure vessel to test on. 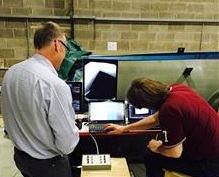 On test samples you can never simulate the real challenges as good as with a real asset. Tetting access into the vessel, reaching all areas, how to scan efficiently, lighting, etc. are examples of challenges which can be addressed by testing on an actual asset. Having the possibility to test on a real asset means that PETROBOT can be well prepared for the tests in “the field” that will take place during the the third quarter of 2015. Above is a picture of the inspection system mounted on the SNAKE tool wrist. 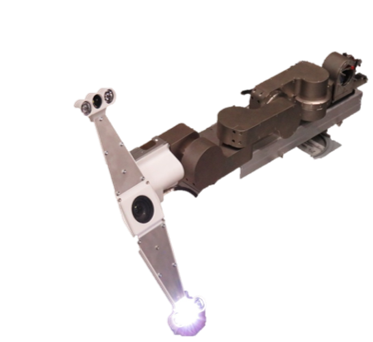 In the centre is a high resolution camera and the extended light arms are enabling defect detection by different shadowing effects with raking light (light incident in an angle towards the surface and camera). All lights are individually controlled. The photo to the right shows the team monitoring the data received. The above picture is a snapshot from the video camera of a weld inside the pressure vessel. Above is a picture of a topographic view of surface irregularities in a weld. The topographic view is made by another tool implemented by DEKRA. It is the Gocator that enables measuring depths of pitting or as in this case irregularities in a weld. The colours indicates different “height” also visualised by the 3D view.